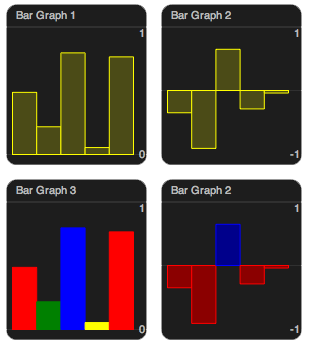 UI Object that displays a bar graph based on the output from a module. color stroke color of the bars or color list "yellow"
fill fill color of the bars or color list "#4b4b17"
Attributes without default values must be specified. The colors can be specified as a single color name ("red") or as a hexadecimal color value ("#F00" or "#FF0000"). It is also possible to list colors that are used for each consequtive bar ("red, greed, blue"). Alternatively, a color look up table can be specified, e. g. "LUT_gray", "LUT_fire", or LUT_spectrum". Color tables can not be combined with color names.